Riders of the world, unite! No longer shall we tolerate the oppressive wetness of rain, the tyranny of moisture; stand up for your dryness my riding brethren, and declare your intentions with the We The Fast waterproof shell from Speed and Strength. Why settle for flimsy, garbage-bag thin poly protection from the elements? With the Speed and Strength We The Fast Overshell, you can cover your protective motorcycle gear with a durable, high quality shell. The We The Fast can be worn on and off the bike, and the integrated stuff sack makes it the perfect accessory when rain clouds appear. The removable hood and integrated Napoleon pocket, along with true seam-sealed waterproof protection, make this shell as versatile as it is functional. 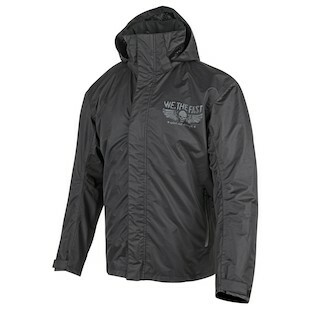 You need to be seen when riding in the rain, and the We The Fast shell does not disappoint. With covert reflective paneling on the chest, back and arm, you will stay low profile until it is time to stand out. Ben Franklin probably could have used one of these when he was out electrifying keys in the lightning storm! Make a declaration of your independence from wetness, and pick up the We The Fast shell from Speed and Strength.